Happy birthday! Edina is 3 years old…going to pre-school! 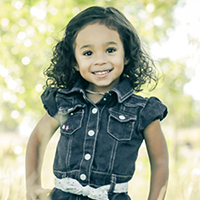 It is now three years since my beautiful grand-daughter, Edina Rose was born on September 14, 2010. Edina has given me an opportunity to not only spoil her, but to also observe her from a different perspective. When I had my own kids 30+ years ago, I, too, read the child development books. I was always trying to make sure that I was giving them the best opportunities for good health, learning and success. My two daughters have grown up to be very bright, beautiful and loving adults…I am blessed. The demands of being a parent are tremendous; great excitement tempered with fatigue, time management challenges and basic survival! 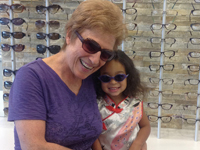 Being a grandmother and a developmental optometrist, still allows me to watch little Edina grow and develop, but without all the demands of being the parent. With my passion and interest in helping children with learning, I am, of course, closely monitoring her development. As pre-schoolers, it is important for them to continue development of eye/hand/body coordination, eye teaming, and depth perception. Your child should have already received his first vision assessment from a developmental optometrist, it’s now time for his 2nd vision evaluation. Remember, sending kids to school with vision problems is like going to work without the primary resources that you need for your job. 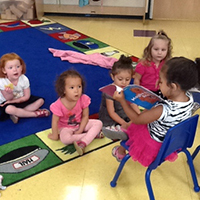 Developmental visual skills are an essential part of school readiness. Click here to review previous posts on Vision Development through Edina’s Eyes. Get your child outside as much as possible–even in the colder weather. 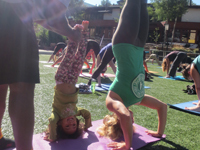 Well-chosen outdoor play games can provide for plenty of fun, exploration, education as well as physical development. Remember, I don’t want any parents worrying about their baby because of certain developmental “cut-off” dates. Development does not always progress in a smooth manner. All children develop at their own rate. Ask your doctor or nurse if you have concerns with the development or health of your baby. I am blessed to be a part of my child’s and grandchild’s life. There is just no way to describe the love, fun and beautiful experiences that children bring to my life. In the next several e-newsletters, academic and sports activities will be presented. Stay tuned for more! Please send me your comments and ideas for future topics! Tip #20: V I S U A L I Z E See It!